Marines and Sailors trained for what has been referred to as the toughest marine offensive of WWII. 1,300 miles northeast of Guadalcanal, the Japanese had constructed a centralized stronghold force in a 20-island group called Tarawa in the Gilbert Islands. RADM Shibasaki, the Japanese commander there, proclaimed, “a million men cannot take Tarawa in a hundred years.” Ultimately, the objective took 9,000 marines only four days (November 20 to November 23, 1943) – but not without a staggering 37% casualties. US victories at Tarawa, New Guinea and the Solomon Islands marked a turning point in the war. 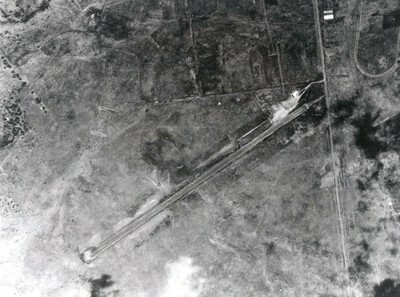 The Marines would reconstitute at Camp Tarawa at Waimea, on the Island of Hawaiʻi. Originally an Army camp named Camp Waimea (when the population in town was about 400,) it became the largest Marine training facility in the Pacific following the battle of Tarawa. Pyramid tent cities and streets of long convoys of jeeps, trucks, half-tracks, tanks, artillery and amphibious ducks made up the formidable, but top secret, Camp Tarawa; over 50,000 servicemen trained there between 1942 and 1945. 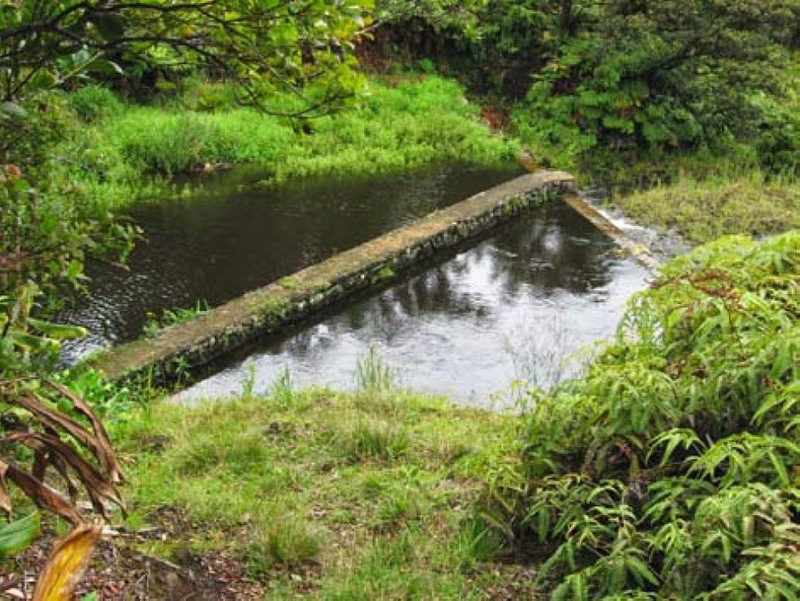 A lasting legacy of the military presence in Waimea was an addition in the community’s drinking water system – “Marine Dam” – it’s still in use and is located above Waimea Town near the lower edge of the forest. Marine Dam is a diversion dam in Waikoloa Stream at the 3,460-foot elevation, built during World War II by the US Engineering Department to supply water for the military encampment of several thousand Marines in Waimea. Built in 1943, the 5-foot high dam captured stream water into a 12-inch lightweight steel clamp-on pipeline. In 1966, the steel pipeline was replaced by a more durable 18-inch ductile iron pipe. A still basin and a cleanout were also added. Today, the Marine Dam serves its original function and is a major source of drinking water for the South Kohala Water System, which provides drinking water as far east as Paʻauilo and west to the Waiemi subdivision on Kawaihae Road. Hawai‘i County Department of Water Supply (DWS) relies on the streams of Kohala Mountain for its primary source of water. 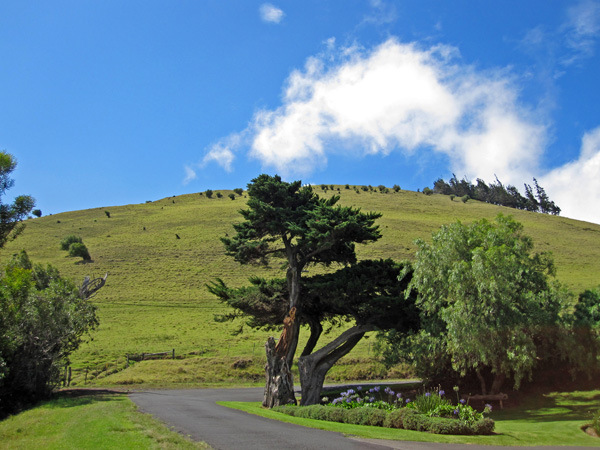 The primary sources for the Waimea Water System are the mountain supplies from Waikoloa Stream and the Kohākōhau Stream diversion. The surface water sources are supplemented by the Parker Ranch groundwater well. Surface water is treated at the Waimea Water Treatment Plant and blended with groundwater before distribution. There are three 50-million-gallon reservoirs in the Waimea system, although one of them is out of commission as a result of damage from the 2006 Kiholo Bay earthquake. Two were initially damaged, but one has since been repaired. The dam seems to also have helped native species; two Koloa ducks were observed on October 30, 1968 in a small pool of Waikoloa Stream approximately 400 yards above the Marine Dam, Kohala Watershed, and expressed the opinion that this was the “first sighting of wild Koloa on Hawaiʻi in more than 20 years”. To receive a landmark status, the facility must be at least 50 years old and of significant value to the community. DWS is permitted by the State’s Water Commission to take 1.427-mgd total from its diversions at the Marine Dam and Kohākōhau Dam, which is approximately 33% of the median daily discharge of Waikoloa and Kohākōhau streams combined. The average or “mean” annual daily flow at Waikoloa stream is 9.12 cubic feet per second (cfs) (5.89 (mgd;)) however, this mean flow likely occurs only 20-30% of the time. The image shows Marine Dam (MKSWCD.) In addition, I have added some other images in a folder of like name in the Photos section on my Facebook and Google+ pages.